U.B. VASUDEV writes from Tampa, Flordia: Down memory lane, while growing up in Mysore, we looked forward to the Dasara or the Navarathri holidays. Those ten days, which signified goddess Chamundeshwari’s victory over the demon Mahishasura (symbolizing the triumph of good over evil), were the most enjoyable time every year. The entire City wore a festive look. As far as I can remember, everyone was high-spirited though everything remained routine year after year. “Pattada Bombe” which perhaps symbolized the King and Queen among all the dolls arranged for the “Bombe habba” got new dresses; the woman was draped in a jari bhutta sari and the man in the typical Mysore Durbar dress ie, white trousers, black long coat with a gold bordered sash around the shoulders and the famous gold striped Mysore “peta” (turban). It was almost an unassigned task for us kids to wait outside our houses for the booming, reverberating sound of the cannons from the Palace Gun House heralding the auspicious arrival of Dasara to the Mysore Palace and let our mothers know so that they could install the “Kalasha” and observe the festivities. The festivities were low key for the first six days and reached a crescendo by the seventh day, Saraswathi (the goddess of learning) pooja, when we excitedly piled up all our books to be worshipped so that we did not have to touch them for, at least, a few more days! The eighth day was Durgashtami. The ninth and the tenth days were the most spectacular. On Mahanavami, everything from knives to scissors to our bicycles was spotlessly cleaned for the Ayudha (weapon) pooja. All the buses, cars, shah-pasands (the illustrious Mysooru Kudure Gadi) and other transports all over Mysore were richly decorated for the occasion. n the Palace, public with prior permission from the Palace authorities were allowed to the bleachers in front of the “Bombe thotti” (pavilion of dolls) to watch the celebrations. After a long wait of two to three hours and as we were getting hungry and impatient, His Highness in his ceremonial attire was escorted to the specially erected canopied platform in front of the Palace to offer pooja. The spectators would be in a state of mystic abstraction for the next hour or so watching the royal paraphernalia that included all his cars, elephants, horses, the silver and gold chariots and many more pass in front of them. The Amba Vilas Palace, an amazing example of the opulence of the Mysore royalty, designed by the British architect Henry Irwin and built at the turn of the century (1897-1912) was illuminated for all the ten days in addition to some of the public buildings and other landmarks in the city. Welcome arches were erected all over the city with banners proclaiming long life to the revered son of Yaduvamsha (Chiramabhivardhantam Yadusantana Sri). His Highness late Sri Jayachamarajendra Wodeyar conducted the durbar every evening starting at 7 pm. At that exact moment, hundreds of thousands of bulbs lit the Indo-Saracenic structure that made it look like an illuminated mirage. The presence of the former king heightened the spirit of the festivities. Legend has it that the bejeweled silver and gold throne made of fig wood and once overlaid with ivory, originally belonged to the Pandavas and is supposed to have come through the Vijayanagara rulers to the Wodeyars of Mysore. With the rich embellishments, it shone under the floodlights of the majestically decorated hall. A select public was allowed to attend the royal court and only those with the traditional durbar dress were allowed inside. After a brief entertainment, mostly a classical music concert by one of the eminent musicians of that time, folk dances or a wrestling match in the ring in front of the palace, the guard of honor followed and the evening culminated with the state elephant garlanding the chief. almost impossible to explain in words the magnificence that pervaded the city that afternoon. The entire route of the royal cavalcade, about five miles long, from the Mysore Palace to the Bannimantapa was exquisitely decorated with multicolored lights. The businesses on Sayyaji Rao Road erected stages all along the parade route to garland His Highness and offer their respects. Crowds of people from all over the country lined the parade route, positioned themselves on buses, cars, buildings and fences enroute to watch and admire their favorite king on the elephant back in the storybook spectacle. A pair of Nandi Kamba(s), decorated bamboo posts carried in a pouch around the waist by the performers and assisted by two or three who held the tethers attached to it for support, led the procession that used to leave the Mysore Palace sometime in the late afternoon. The entire army that belonged to the Mysore King(s) took part in the parade. All the distinguished personnel associated with the Palace usually were on horseback or walked in front of the elephant carrying His Highness. Usually, a huge carriage drawn by the elephants (Aane Gaadi) used to house the palace musicians, Asthana Vidwans who used to be in concert all along the parade route. His Highness, with his uncle behind him, sat in the golden howdah (ambaari with 80 kilograms of gold on a wooden frame) that was tied on the back of the tall and majestic Biligiriranga, a magnificent pachyderm. 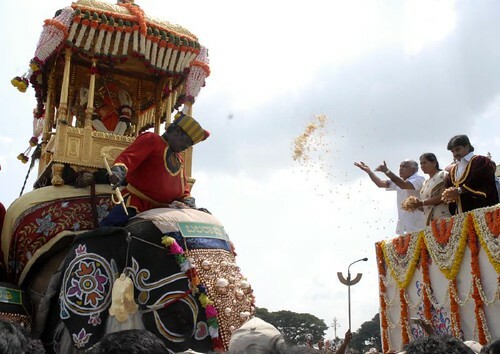 Also in the parade were the state horse (Pattada kudure) and the state elephant (Pattadane) that carried the presiding deity of the royal family, goddess Chamundeshwari. Also went along the white dancing horses, the royal Lippizzans that had their tails painted in a rainbow of colors. After resting for a while at Bannimantapa, His Highness would perform pooja to the legendary Shami tree and carry a branch of the same back to the royal residence. The Mahabharata legend has it that the Pandavas hid their arms inside the Shami tree while in exile. Before the famous battle of Kurukshetra, they performed the ritualistic worship to the tree in gratitude and recovered their arms. After a brief entertainment and a torch light parade in honor of the Excellency, the procession would be on its way back to the palace. The return procession had a grandeur of its own. I remember heavy downpours as if the heavens were pouring their choicest blessings on the King and his people, on several occasions. The procession served the purpose of contact between people and the King, as they could not see the king on other days. The other aspect may be, during the olden days kings used to worship the family deities to invoke their blessings before embarking on wars with their elephants, horses, camels and the military. That may be the background for the procession. As far as we know, the Mysore Dasara was the best show in all the princely States of India. We have not heard of any other princely state celebrating Dasara with such pomp and pageantry. The last Dasara procession with His Highness late Sri Jayachamarajendra Wodeyar was in 1973. When I visited the palace six years back, I was told that his son Srikantadatta Narasimharaja Wodeyar still continues to maintain the tradition and follow in the footsteps of his predecessors. He conducts durbar every day during the ten-day festival, albeit on a much smaller scale in the Amba Vilas hall, the diwan-i-khas of the Mysore Palace. The palace is illuminated every evening for about an hour or two and the other activities are continuing though the support from the people has dwindled. It looks as though the magnificence associated with the festivities faded with the late Sri Jayachamarajendra Wodeyar who was very highly respected by his subjects. The State of Karnataka has tried to continue the tradition without much participation and glitter, however. It is sad to think that the ten-day festival that was once the crown jewel for the City of Mysore has become just a crown without any sparkling jewel in it. Thus, it is a pleasant though poignant memory for the Mysoreans of yesteryear! This entry was posted in Kannada & Karnataka, Mysore-Bangalore, Once upon a time, People and tagged Amba Vilas, Ayudha Pooja, Bannimantap, Chamundeshwari, Churumuri, Durga, Henry Irwin, Jayachamarajendra Wodeyar, Mahishasura, Mysore Dasara, Mysore Palace, Pandavas, Sans Serif, Saraswathi, Srikantadatta Narasimharaja Wodeyar, Yaduvamsha. Bookmark the permalink.